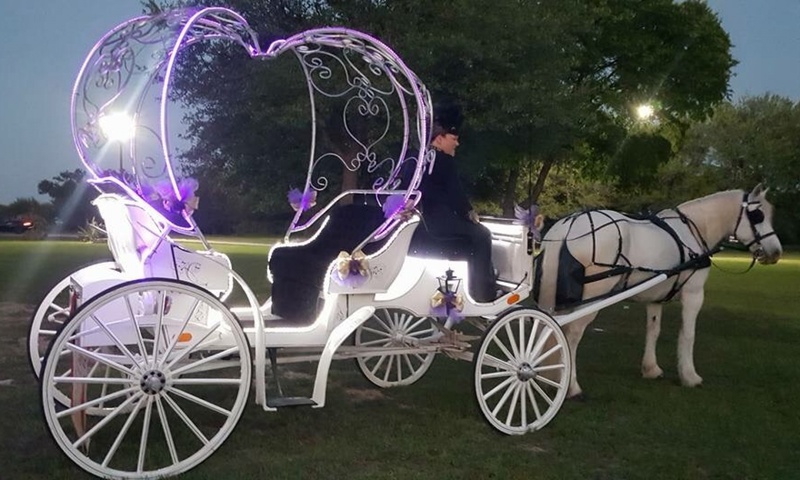 We used Fantasia Carriage for our daughter's recent wedding and the grand exit was beautiful and will be something that our daughter and son-in-law will remember forever! Robin is very professional! Thanks so much! January 2019 We used Fantasia Carriage for our daughter's recent wedding and the grand exit was beautiful and will be something that our daughter and son-in-law will remember forever! Robin is very professional! Thanks so much! Robin is meticulous, careful, personable, and the best carriage driver you could have. She toted some lucky members of the Hill Country Singers in the 2015 July 4th Lago Vista city parade, and we couldn't have been in better hands while looking absolutely fabulous. Even Diva, the beautiful horse, was patient beyond belief, with all the stoppings and startings and kids who wanted to pet her. Fantasia Carriages only gets five stars because I can't give ten. July 2015 Robin is meticulous, careful, personable, and the best carriage driver you could have. She toted some lucky members of the Hill Country Singers in the 2015 July 4th Lago Vista city parade, and we couldn't have been in better hands while looking absolutely fabulous. Even Diva, the beautiful horse, was patient beyond belief, with all the stoppings and startings and kids who wanted to pet her. Fantasia Carriages only gets five stars because I can't give ten. Robin was amazing!! I used Fantasia Carriage for my grand entrance at my wedding. Robin came out to the venue a few weeks beforehand to make sure there would be enough room for the trailer and to plan out a route for the carriage ride. On my wedding day, she was so professional, helpful and ready for anything!! The horse was so friendly and patient while we took a million pictures!! Fantasia Carriage made me feel like a princess!! Thank you!! November 2018 Robin was amazing!! I used Fantasia Carriage for my grand entrance at my wedding. Robin came out to the venue a few weeks beforehand to make sure there would be enough room for the trailer and to plan out a route for the carriage ride. On my wedding day, she was so professional, helpful and ready for anything!! The horse was so friendly and patient while we took a million pictures!! Fantasia Carriage made me feel like a princess!! Thank you!! Lovely carriage beautiful horses, and amazing service. July 2016 Lovely carriage beautiful horses, and amazing service. Robin and team at Fantasia Carriage were awesome to work with and were a great hit for our wedding. She was thorough in her planning and rehearsal and worked very well with our wedding coordinator. On the day of, Diva was beautifully costumed and a pro at doing her part in the Baraat. We also got a carriage ride as part of our exit after the ceremony, which was a nice addition we were very happy with. We highly recommend Robin and Fantasia to everyone! September 2018 Robin and team at Fantasia Carriage were awesome to work with and were a great hit for our wedding. She was thorough in her planning and rehearsal and worked very well with our wedding coordinator. On the day of, Diva was beautifully costumed and a pro at doing her part in the Baraat. We also got a carriage ride as part of our exit after the ceremony, which was a nice addition we were very happy with. We highly recommend Robin and Fantasia to everyone! Best in the business! Totally professional. Sweet and personable and that goes for the horses too! February 2017 Best in the business! Totally professional. Sweet and personable and that goes for the horses too! Kind, professional, and so easy to work with. Robin and her team did a great job for the baraat at our Indian wedding! She worked with our wedding planner to visit the venue and plan out the details of the baraat route. Diva was great during the parade, and our guests were especially impressed to see that the horse handlers were all in traditional Indian outfits as well! October 2018 Kind, professional, and so easy to work with. Robin and her team did a great job for the baraat at our Indian wedding! She worked with our wedding planner to visit the venue and plan out the details of the baraat route. Diva was great during the parade, and our guests were especially impressed to see that the horse handlers were all in traditional Indian outfits as well! Robin is very dedicated to providing the most beautiful and memorable event. She decorates her carriage to match wedding colors and even takes time to color Divas hooves. She is very flexible and understanding during the events, if it's running behind of schedule or change in route due to weather she is very accommodating. March 2017 Robin is very dedicated to providing the most beautiful and memorable event. She decorates her carriage to match wedding colors and even takes time to color Divas hooves. She is very flexible and understanding during the events, if it's running behind of schedule or change in route due to weather she is very accommodating. Robin is amazing and professional to work with. Diva is a sweet gentle and a good looking horse that gets to carry, I would say about 99% of all Indian grooms as they process to their wedding ceremony, if they chose to do a Baraat. She is always there on time and ready to go, some times very early as 7 am if we have to get started. As an Indian Wedding Planner here in Austin I work with Robin very often and can always count on her and Diva for setting off the start of the wedding with a grand entrance with Diva each time. I would recommend them 100%. March 2018 Robin is amazing and professional to work with. Diva is a sweet gentle and a good looking horse that gets to carry, I would say about 99% of all Indian grooms as they process to their wedding ceremony, if they chose to do a Baraat. She is always there on time and ready to go, some times very early as 7 am if we have to get started. As an Indian Wedding Planner here in Austin I work with Robin very often and can always count on her and Diva for setting off the start of the wedding with a grand entrance with Diva each time. I would recommend them 100%. Carriage was absolutely gorgeous. Ms. Robin and crew were great. They were professional and friendly. They even offered ideas for the pictures we took. Upon arrival they let the kids meet the horse, which they enjoyed and after our departure they even allowed kids to ride in carriage. Fantasia Carriages went above and beyond to make our Fairy Tale wedding come to life. April 2017 Carriage was absolutely gorgeous. Ms. Robin and crew were great. They were professional and friendly. They even offered ideas for the pictures we took. Upon arrival they let the kids meet the horse, which they enjoyed and after our departure they even allowed kids to ride in carriage. Fantasia Carriages went above and beyond to make our Fairy Tale wedding come to life. Robin was amazing! We asked her and Diva to star in my husband's baraat for our wedding in May and it was absolutely incredible! Robin came to our venue a few days before to map out her route and spoke to me about all the details she keeps in mind for the event. She reassured us that Diva is very well trained and used to loud noises (drumming during the baraat). She has to be up very early to prepare Diva and the decorative pieces involved. May 2017 Robin was amazing! We asked her and Diva to star in my husband's baraat for our wedding in May and it was absolutely incredible! Robin came to our venue a few days before to map out her route and spoke to me about all the details she keeps in mind for the event. She reassured us that Diva is very well trained and used to loud noises (drumming during the baraat). She has to be up very early to prepare Diva and the decorative pieces involved. Caring professionals, beautifully customized to every theme and occasion! We loved meeting Diva, the star of the show! May 2017 Caring professionals, beautifully customized to every theme and occasion! We loved meeting Diva, the star of the show! I rented Fantasia Carriage's horse for my hindu/western fusion wedding. The entire experience could not have gone better. Robin was there for the day of the rehearsal and she was even early to the wedding day. The communication could not have been better and the horse is definitely something that "made" our wedding accordingly to most, if not all, of our guests. What we didn't expect was that Robin and her assistant were both wearing indian outfits which was an awesome touch. There aren't many options in Austin for horse rentals for Indian weddings ("baraat"), but even if there was, I still would have been more than satisfied with who I went with. Thank you again Robin for making this such a great experience and an awesome touch to our fusion wedding! April 2017 I rented Fantasia Carriage's horse for my hindu/western fusion wedding. The entire experience could not have gone better. Robin was there for the day of the rehearsal and she was even early to the wedding day. The communication could not have been better and the horse is definitely something that "made" our wedding accordingly to most, if not all, of our guests. What we didn't expect was that Robin and her assistant were both wearing indian outfits which was an awesome touch. 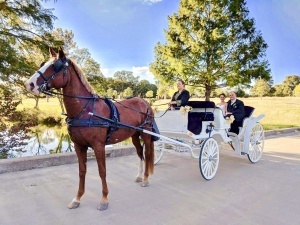 There aren't many options in Austin for horse rentals for Indian weddings ("baraat"), but even if there was, I still would have been more than satisfied with who I went with. Thank you again Robin for making this such a great experience and an awesome touch to our fusion wedding! Fantasia Carriage exceeded our expectations! They helped us host a princess party for patients from the local children's hospital and it was a truly magical experience for our young friends and all that were in attendance. We highly recommend them for any event! They are wonderful! August 2017 Fantasia Carriage exceeded our expectations! They helped us host a princess party for patients from the local children's hospital and it was a truly magical experience for our young friends and all that were in attendance. We highly recommend them for any event! They are wonderful! Excellent! They came in traditional garb with a beautiful horse, also dressed, and brought a stepping stool. I wasn't able to attend the event myself as per tradition, but my fiance said he loved it, and that the horse was very well trained. April 2018 Excellent! They came in traditional garb with a beautiful horse, also dressed, and brought a stepping stool. I wasn't able to attend the event myself as per tradition, but my fiance said he loved it, and that the horse was very well trained.